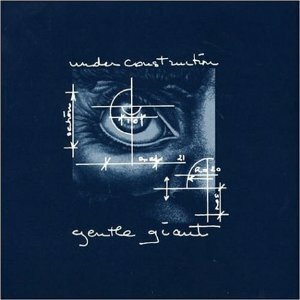 Gentle Giant was at its best when adding polyphonic arrangements to aggressive rock music. Determining who was responsible was merely a scan of the writing credits, where "Shulman, Shulman and Minnear" was typically credited with the bulk of the work. Under Construction goes the extra step to pinpoint keyboardist Kerry Minnear as the gifted brains of the band. Maybe the package should be called Minnear’s Revenge since we’re now privy to a bird’s eye view of his ideas and their development from those piano based themes ( chronicled on disc two). Disc one is a combination of different sources, including unearthed 1970 BBC out-takes from the very first album. "Hometown Special" features what may be the first vocal rounds which would later be an important element in the repertoire. "A Round" appears to be a clever rehearsal for "Playing the Game" with chorded electric guitar playing over looped sections of the track (including unison recorder and additional electric guitar). Also included are excellent live versions of "Interview" and "Timing" (known for the heavy drum and percussion arrangements) from a German concert. Disc two focuses on licks, riffs, fragments and the little bits that Minnear has salvaged from his personal tapes and sorted into a listenable order. Check out the demo for "Peel the Paint," with his abrasive organ style. Core band members were involved in contributing to liner notes including now record executive, Derek Shulman and his hot shot producer brother, Ray. The set should appeal to the ardent collector as well as provide a keen introduction to a rare and wonderful genius.